Fri, Jul 6, 2018, 08:55 am SL Time, ColomboPage News Desk, Sri Lanka. 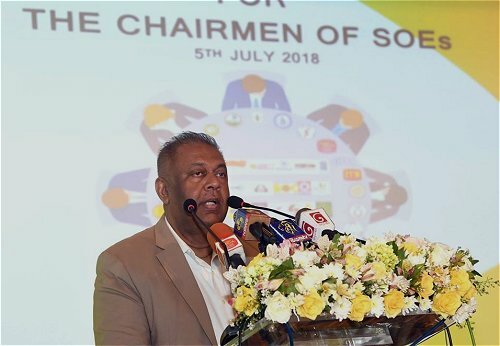 July 06, Colombo: Sri Lanka's Minister of Finance Mangala Samaraweera says the practice of maintaining loss-making State-Owned Enterprises (SOEs), with the public money should end and they need to make reasonable improvements in their financial management. Speaking at a Conference for the Heads of State-Owned Enterprises (SOEs) on Thursday, the Minister emphasized that their conduct of business plays an essential role in the daily life of their fellow citizens, as well as the productive performance of the country's national economy. "Last year, in the Vision 2025 document, we outlined our government's policy on the management of public enterprises that proposes to eliminate unproductive expenditure. In #V2025, we made a pledge to restructure SOEs to enable them to operate as commercially viable ventures with accountability," he noted. The Conference, sponsored by the World Bank and the Australian High Commission, was held with the objective of improving the financial efficiency of SOEs and statutory boards in accordance with the principles of good governance. According to Minister Samaraweera, during 2017, 55 public ventures alone have recorded a total turnover of nearly Rs. 1800 billion which was almost 13.22 percent of the GDP. Out of the 55 SOEs, 39 recorded a net profit that amounted to Rs. 136 billion while 16 made net losses that amounted to Rs. 87 billion in 2017. Last year, four of the main loss making SOEs - Ceylon Electricity Board, Sri Lankan Airlines, Sathosa and Agriculture and Agrarian Insurance Board combined in losses amounting to Rs. 84 billion. "I may say this as a dismal performance that creates public outcry over the mismanagement of our national resources," he said. "We cannot pass on the cost of inefficiency on to the consumer or the general public and therefore it is essential that SOEs eliminate management inefficiencies prior to the implementation of fully cost reflective pricing," Minister Samaraweera stressed. The Minister underscored that as the key players in the national ventures, the SOEs may have to relook at their operations seriously to achieve reasonable management improvements in the interest of public. Given the importance of the SOE's, the government's strategy is to encourage and facilitate SOEs to be self-sufficient through improved corporate practices, management reforms, innovative financing, strong and prudent financial management, exposure to competitiveness and international best-practices and effective human resource management, while enhancing public accountability, the Minister highlighted.